We pride ourselves on our group’s growth, our people and the values we hold at the core of our businesses. At HL Agro, every day brings new possibilities, learning and excitement. A truly entrepreneurial environment, incredible learning, and fast-track career growth are integral aspects of our culture. We also believe in taking early bets on talent, as we grow and move closer towards our 2020 vision. We build long-term relationships with our customers and employees by working together on projects across multiple industrial sectors. This opens up broad career options and the chance to develop your skills in a wide range of roles. Jobs at HL Agro are varied and diverse – from technical roles in engineering, science, manufacturing and industrial work to business roles in areas such as marketing, sales, administration, commercial, human resources and logistics management. HL Agro is committed to helping employees feel valued and inspired. We aim to attract, retain, empower, and motivate our employees and to create an inclusive environment where all feel welcome. We’re growing all the time and wherever we go and whatever we do, our people grow with us. We give talented and innovative individuals the chance to explore varied career paths in a challenging and rewarding environment. We innovate through teamwork. Our successes and accomplishments are driven by embodying and upholding values, which include collaboration, creativity, integrity, inclusiveness and relevance. We could not pursue our large-scale projects without our multidisciplinary approach and the talented people who join forces with each other every day. This is why we’ve embedded in our work processes ways to encourage teamwork & inclusion in our workforce, workplace and our programming. On our easy to use career portal, submit your resume and tell us all about your education, skills and experience. Preliminary interview followed by an assessment which looks at your alignment to our core values & Enterprise Success Factors. Interview/s, where our leaders collaborate while hiring and then arrive at a consensus. 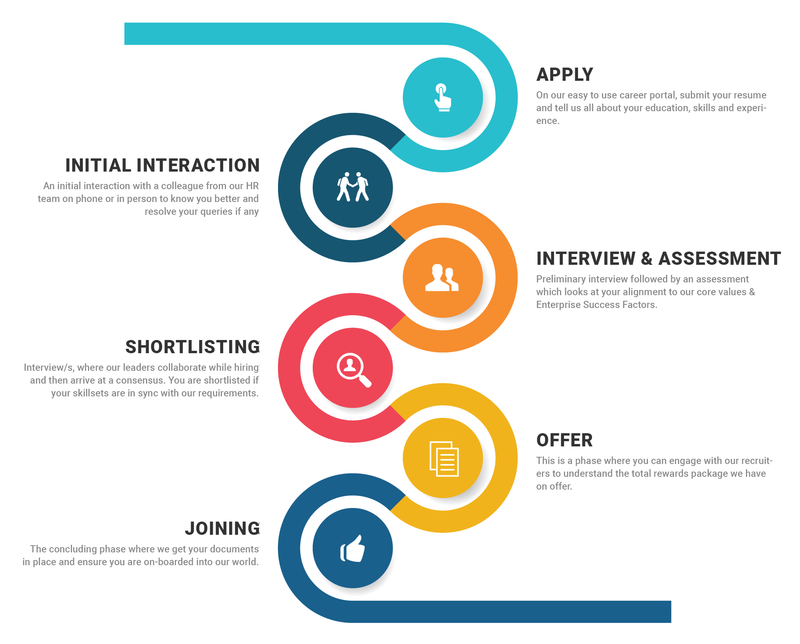 You are shortlisted if your skillsets are in sync with our requirements. This is a phase where you can engage with our recruiters to understand the total rewards package we have on offer. The concluding phase where we get your documents in place and ensure you are on-boarded into our world.